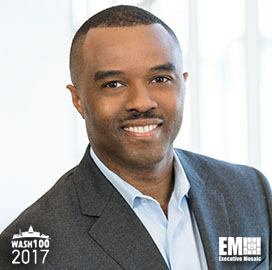 Executive Mosaic is glad to unveil Neil Green, president of Intel‘s federal business, as an inductee into the 2017 edition of the Wash100 — Executive Mosaic’s annual selection of influential leaders in the government contracting arena. Green oversees Santa Clara, Calif.-based Intel’s work with the federal government and concurrently serves as vice president of the data center business group. In an article written for FCW published in February, he pointed to the National Strategic Computing Initiative and Cancer Moonshot program as examples of governmental efforts that work to encourage public-private collaboration on the development of high-performance computing systems. Intel reported in November the company exceeded its 40 percent target for hiring of women and underrepresented minorities in the U.S. during 2015 and established a 45 percent diverse employment goal for 2016. Green partly attributed challenges associated with the retention of African-American employees to a lack of manager-employee conversations that can lead to coaching or promotion. “From the folks that I’ve talked to, I think African-Americans get frustrated that they’re not progressing faster,” he said of the minority retention issue. Green’s nearly eight-year career with Intel also includes roles such as senior director of strategy and market intelligence on data center and connected systems, chief product officer and director of worldwide sales and operations group. Executive Mosaic congratulates Neil Green and the Intel federal team for their selection to receive this award.